I love it! The colors are so vivid and it sort of has an Egyptian feel to it. Yup you're obsessed. :) This ring is wonderful. Can't find a bad thing about it. I LOVE looking at big pieces of jewelry - these colours are so pretty (haha, you're getting me obsessed). Thanks for your lovely comments recently & it's soo cool you've seen the tea estates in Korea (that is something I would like to do one day :)). It's size is so distinctive. I LOVE House of Harlow too. I think this ring is beautiful, I would buy it! I love the ring, great colors. i love house of harlow jewelry an this ring is no exception... great find! Wow, that's one bummer of a ring. Love it! what do i think?!?! i want it! i have to have it! i love it!!!!! You know I love HoH. 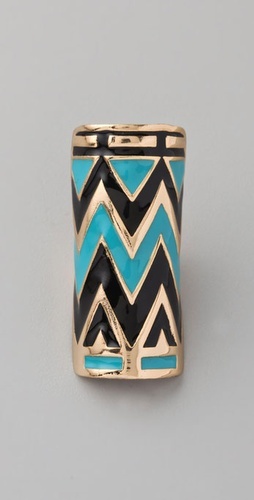 I was so happy to see the new pieces go up on Shopbop - definitely added some to my Christmas list. Yes, I pretend I'm going to wait until Christmas to buy things, maybe it'll work haha. I love this bold ring! I don't own any House of Harlow, but I keep seeing it and wanting it! 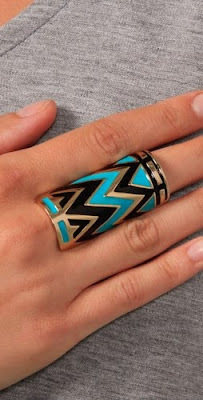 i Love Turquoise and i LOVE this ring~ definitely considering buying this one, Thanks for the post! I LOVE it! House of Harlow has the most beautiful jewerly, at least in my opinion! :):):) And have you seen the clothes in her Winter Kate line? Loving this, definetly would love to have!! Totally worth it!! Statement piece and you won't be sorry, EVER!! I definitely have ring-envy right now! That ring is SO cool!! Oh my gosh. The colors are just so awesome.